1/2 Gallon Extra Fuel - Emergency Fuel Solution NON Flammable 5 Worldwide Patents ExtraFuel. holds 5 worldwide patents, is EPA approved, DOT approved, and NFPA approved non- flammable gasoline derivative. 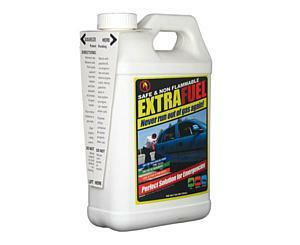 It has the same properties of gasoline, however it is not gasoline and contains no volatile butanes, pentane, hexanes or heptane's, and is 100% safe to store in the trunk of your vehicle, keep extra in your garage or storage unit - Perfect for out of gas roadside emergencies, natural disaster preparedness, and in any emergency 'out of gas' situation.